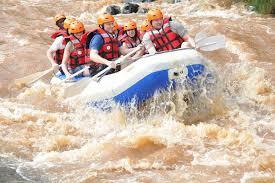 White water rafting on Tana river departs daily from Nairobi. The drive to the Sagana campsite takes about one and half hours.The Drive to Sagana just 95kms from Nairobi. A rafting trip on the river offers a combination of 16kms of white water ( up to class V in season ) These excursions are seasonal depending on the water levels. Upon arrival you will be welcomed and offered cup of tea or coffee with biscuits. After the refreshments, you will be given a safety briefing before being transported up to Tana river to the departure in point where you will be provided with life jackets, helmets and the paddles. Note: ( Entry points are different depending on water levels.) After signing a compulsory release and assumption of risk form, you will drive up to theput in where you willreceive some final practical training before heading down the river. White water rafting is a challange recreational activity using an inflatable raft to navigate a river or other bodies of water, This is usually done on white different degrees of rough water, inorder to thrill and excite the raft passangers. 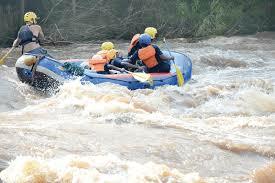 Rafting in Kenya has been going for over20 years and has some ofthe best rafting in the continent. The rivers in Kenya have varying degrees od difficult, but whichever you cjhoose , you will have an adventure you will never forget. 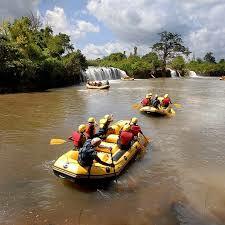 The Tana river is a pool river ofering an exciting day of white water raftin.The adrenaline adventure starts with a 3 kilometer of basic class II and III white water where plenty of oportuinity to gain the practice of paddle skills require running the lower partof the river. A 6 kilometer section follows with an hour or so of relaxation to view the adundance of bird life around, cool off with an optional swim in the warm water. The final 7 kilometer of Tana river back to the campsite starts with some easy class lll waters where paddle commands relinquished again. It is now the 3 big rapids ( class IV and V )with names like Captain Folly, Can of the warms because of its four 90 degrees bends in successions and Sphicter Flexor. Sudject of water levels, you may be able to " surf "in the " Fish eye "and then swim the next couple of minor rapids. Numerous smaller rapids brings one on to the last big one( spasm ) a series of drops over three quarters km section with a big surprise half way through. The trip takes place at Savage Camp where you can enjoy a solar heated shower or relax in the pool before enjoying a three course barbeque lunch. After lunch when everyone is ready, we leave for Nairobi arriving late in the afternoon. Bungee Jumping is an extre sport and it involve jumping from a tall structure while being held around your torso using a body hamess. When the person jumps, the cord stretches and the jumper flies upwards again as the cord snaps back and continues to oscilate up and down until all the energy is dissipated. 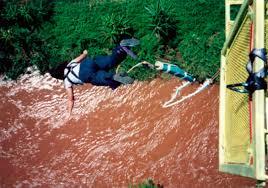 In Kenya bungee jumping is done at Tana river near sagana. A steeltower erected on the banks of the river provides a 60 meters ( 196 feets ) platform from where the plunge is done. Weight Restrictions: For safety reasons, participants are weighed before climbing on the tower.